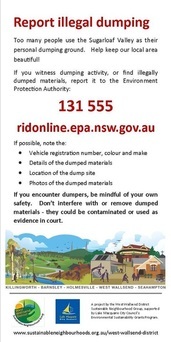 "Dob In A Dumper" initiative to raise awareness of illegal dumping in and around our district. 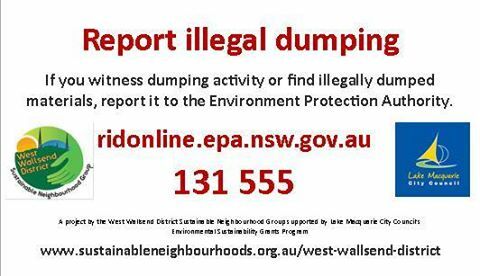 You will all be aware of the great problems we face with illegal dumping in our area and will have seen the new Report Illegal Dumping (RID) signs being placed around our district. Our initiative is to deliver a pack containing an information flyer and fridge magnet to households in our area. These items have contact details of authorities to which you can report illegal dumpers and their activities. Illegal dumping is a huge problem for us because of our abundance of bush tracks and fire trails. Add to this the easy access to our bush areas which means that polluters feel free to dispose of their waste in our district. Sadly many of the illegal dumpers have been found to be from within our district. ​We are working with council rangers to try and stem the flow of seemingly endless rubbish and bring those responsible to account. Our group hopes that you take this opportunity to spread the word and help keep our district rubbish free! As a result of several of our members having completed Landcare Leadership training we are excited to announce that WWDSNG now has its own Landcare group. The West Wallsend District Landcare Group. Our aim is to identify Landcare projects in the area and, with the help of residents and council, begin restoration of these areas. Being surrounded, as we are, with lots of bush and scrub, creeks and walking tracks, there is no shortage of work to be done. Our first project will be the continuation of recovery work in Elizabeth street, Holmesville, adjoining Flaggy creek. We have already done some work at this site, which you can read about here. The Landcare group will meet on the third Sunday of each month at our nominated project site. If you would like to join us in a Landcare project just contact us for details.